Stability is perceived as something positive in financial markets. However, too much stability breeds complacency and risk leveraging, which results in instability. We are headed to one of those rollercoaster moments. Most people think that financial stability is good. Actually, stability is bad for financial markets. Long periods of stability tend to provoke wild swings when market participant wake up from their lethargy. We might be heading to one of those moments. Academics argue that after an exogenous shock, the economy will take its time to come back to balance. And, then, it will hang in there until the next exogenous shock. Practitioners have a different view. After a bust, there is a period of adjustment. Following that, new regulations are written, weak segments of the economic tissue are discarded, and more attractive ones are poised to rise. After the recovery phase, the economy enters a Goldilocks phase, nor too cold, nor too hot. However, that has nothing to do with balance. Actually, according to Minsky, the Goldilocks phase is a guarantee of future instability. The rationale is pretty simple. During the Goldilocks phase, optimism becomes ingrained. Everything seems to be in the right place and people feel confident. When the cracks begin to appear in the form of some bubbles, policymakers face the dilemma of whether to tight or not. If they do tight the monetary policy, the economy might fall into a recession. If they don’t, the economy might become too hot, leading to bubbles formation. There’s also another problem. Policymakers struggle to identify bubbles, and usually, they only spot them when it is too late. We had solid economic growth, low inflation, and calm rising markets. At the beginning of 2018, several analysts told us that the economy would remain stable. However, cracks started to appear. The monetary normalization policy kicked-in and liquidity was taken from the market. Additionally, interest rate hikes didn’t help either. Almost immediately, we saw debt-ridden economies struggling with a strong dollar. As the 10-year yield rose and the liquidity was moped, the equities started to falter. Market participants were incredulous in front of the violent swings, supposedly, happening during the Goldilocks phase. Since enlightened market participants are conscious that violent downturns in asset prices may provoke recessions, thus began an outcry for a pause in interest rates hike. The realization that the Fed was determined, in keeping its normalization route, was directly related to the severe drops in 2018. In last December, there was a lot of people asking for a pause, but the Fed didn’t budge, and another bloodbath followed suit. However, the weeks after the decision saw a different attitude from Powell and the other members. They spread out in interviews and keynotes, emphasizing that the Fed is data dependent and they are sensitive to economic developments. That dovish attitude calmed the markets. The following weeks will define the course of the economy. If the Fed chooses to get back to its hawkish tone, asset prices will follow. Considering that the drop in asset prices that took place last year plus the trade war will have a negative impact on the economic data to be released, in the following weeks/quarters, a hike will only make things worse. Maybe even pushing us to a brief recession. If the Fed chooses to pause, asset price will likely roar, maybe even to out of proportion levels. 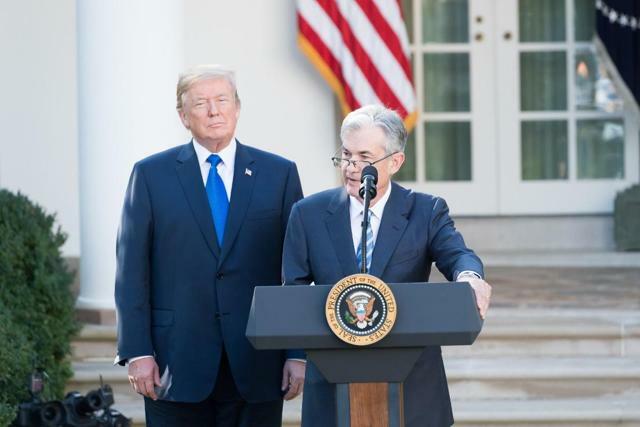 That might help the economic data but will ultimately result in the Fed feeling betrayed and resume its rate hikes course. That process will go on as long as it takes to someone making a mistake. The main problem is that postponing the recession, by using a dovish stance, will result in agents downplaying the market risk. Thus, encouraging higher risk-taking and more leveraged risk. Basically, we have reached a point where a hike too soon or too late will determine the end of the bull market. Either way, you can be pretty confident that the low volatility (VIXY) regime of 2017 won’t be repeated soon. There will be wide swings either way. The S&P 500 (SPY) might enjoy another leg up if the dovishness prevails. After years of stability, there are several imbalances and lots of malinvestment in the economy. Without entering into too much detail (you can find a deeper analysis here), below are two graphs that reveal both excess and complacency. Total credit to non-financial corporations is now near all-time highs. High-yield corporate debt is on the rise, while defaults are near lows. 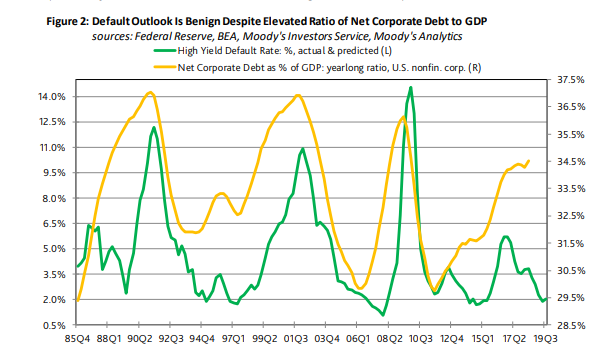 The graphs show credit expansion, significant among corporations, and low default rates. That is the recipe for dangerous complacency. Analysts that still hold positive outlooks, justify them with profit coverage ratios that still seem pretty good and default rates are low. However, we all know what happens when a recession hits and profits vanish. Suddenly, everyone is in dire straits. That said, in the current environment, the Federal Reserve will dominate the conversation. Their decisions will determine a bust now, or postponing the bust and having another leg up and possibly a sizable bubble. Very active investors, at this juncture, should start thinking about removing beta from their portfolios. One simple way is to sift through the cyclical sectors of the S&P 500. You can short homebuilders (XHB), retail (XRT), or financials (XLF) as a way to remove beta from a diversified long portfolio. More diligent investors might even look into these sectors and pick stocks to go short. The problem, however, and here is the point where investment becomes an art, lies on the fact that the outcomes are too symmetric. Removing beta from the portfolio, by shorting cyclical stocks, will hurt your performance if another leg-up materializes. Not removing it exposes you to a recession. Blue pill or red pill? Disclaimer: Shorting stocks is a high-risk strategy. Each investor should evaluate the risks involved and decide in conformity.